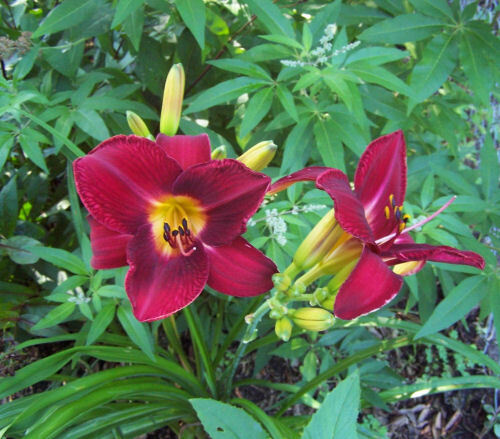 Anyone who gets interested in growing perennials while find themselves also interested in daylilies. These showing perennial bulbs are dramatic, come back year after year and are easy to grow. 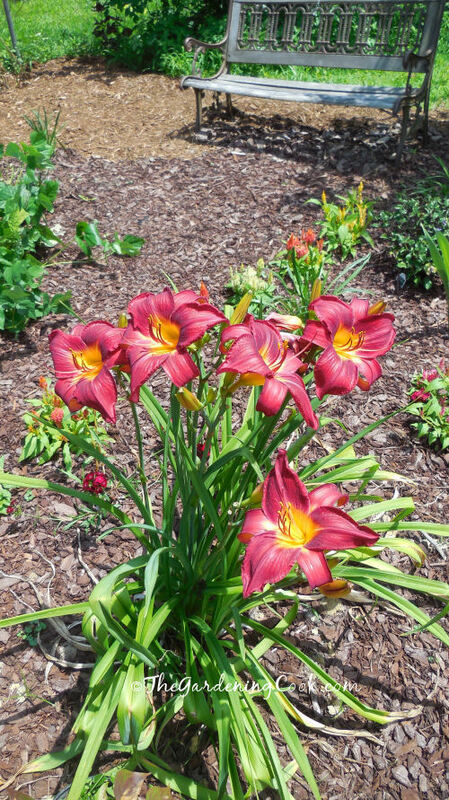 Red Vols Daylily is a spectacular daylily that was a Better Homes and Gardens winner of the year in 2000 and it’s easy to see why. I was so fortunate last year to get an email from a wonderful lady who has since become a good friend of mine. She saw that I am passionate about gardening and offered to send me a daylily from her garden. I was so touched and thankful…. A week or so later, my surprise package arrived. I opened it and set about getting it into my garden right away. 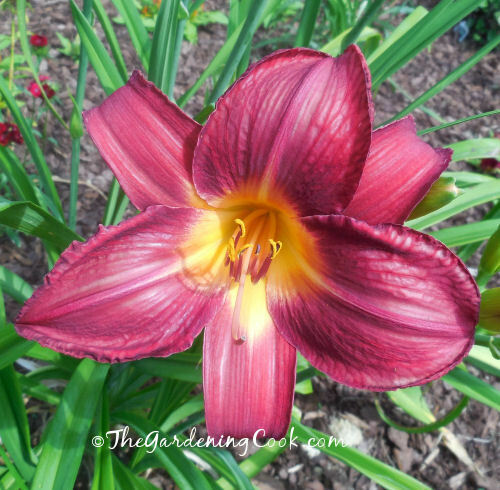 I know that daylilies prefer full sun, but the ones that I have now (here in NC) seem to do a bit better and get bigger blooms if I give them a bit of partial shade during the day. I had the perfect spot in mind. Right near the gate entry to my vegetable garden. I walk through that gate almost every day, so I knew I would often see the lily and admire it (and think of my friend) when I passed by. That was late last summer. Today, the lily is full of buds and starting to flower and is as beautiful as my friend told me it would be. 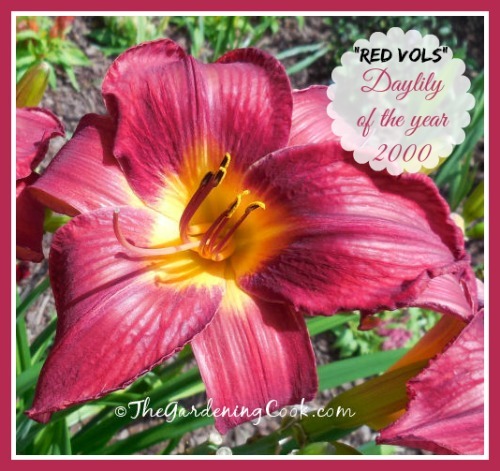 This daylily is called Red Vols and is a Better Homes and Garden winner from perhaps the year 2000. 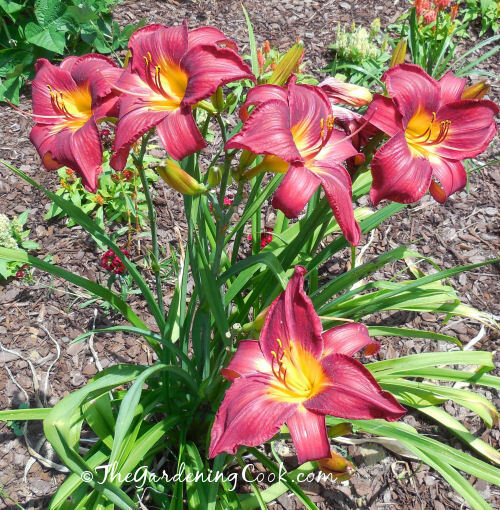 See How to Grow great daylilies here. Red vols Daylily. Better Homes and Garden winner. Close up of Red Vols Daylily. So many buds to open too! Thank you to my dear friend for this gorgeous addition to my garden. I appreciate it, and you, so much! Update for 2014. I ended up moving this day lily to a more sunny part of my garden (my perennial/vegetable garden) and it loves its new home. It did fine where I had it before but I wanted an established plant in my new garden and decided to see how it would compare with a sunnier location. The color of the flower is a bit more muted but the flowers are much more abundant. Here are some updated photos from 2014. Here is a close up of the fabulous flowers. They are at least 7 inches wide and proliferous this year. I love to sit on my park bench and admire this clump. If they look like this after just two years, imaging how they will look in a few more! 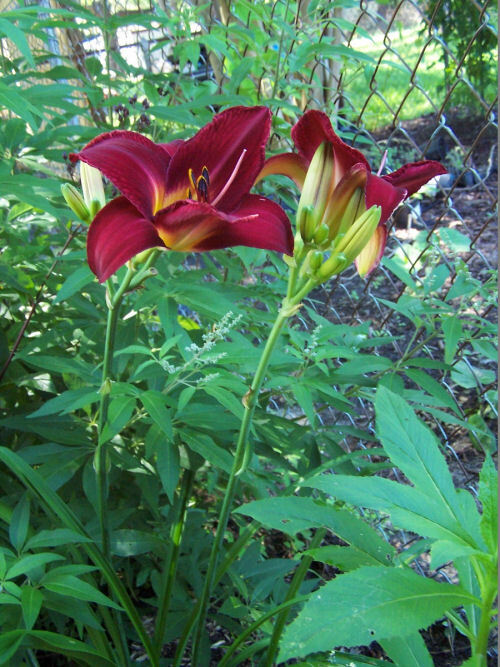 If you would like to learn more about growing daylilies, have a look at Diana Grenfell’s book The Gardener’s Guide to Growing Daylilies. It’s available at amazon.com. 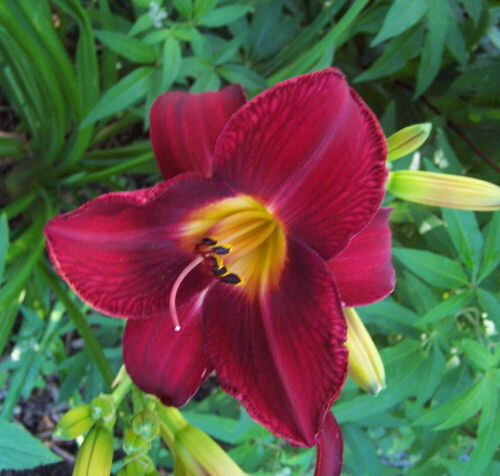 Carol, your daylily is a stunner! What a gorgeous color and I have not seen it before now. I have some of the old fashioned lilies that someone passed along to me that I adore. I will have to look for this plant! Daylilies have long been a favourite in my garden. In fact, at our last house we only had room for one little bed along the side of the pool surround, tucked in next to a big cedar hedge. I planted a series of day lilies in that bed and it was beautiful. Red Vol is a beauty!! It is one of my favorites too. This one was given to me by a lady who runs a gardening blog. She just took a liking to me and sent it to me. It is very special.